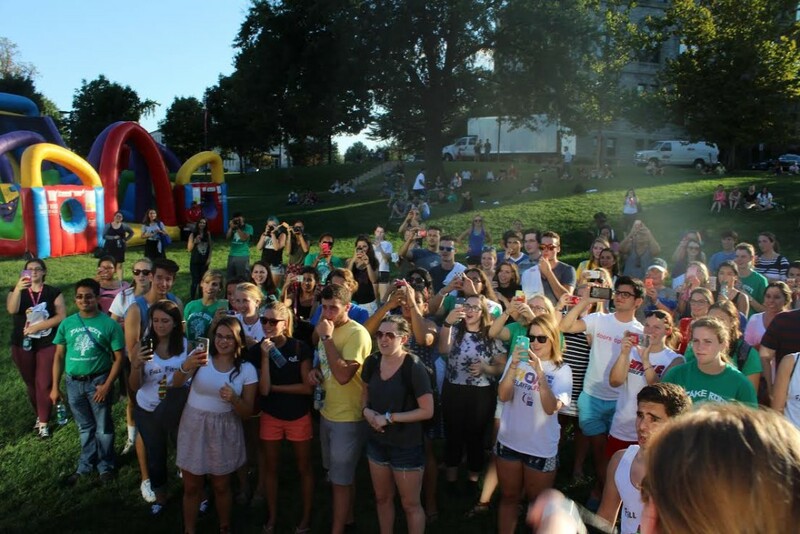 Students stormed the Edward J. Pryzbyla Center lawn and balloons flew through the air as Program Board members dropped the white sheet revealing this year’s Capital Fest performer during Catholic University’s annual Fall Fiesta. Some students were overwhelmed with joy, hugging friends and taking videos to add to their Snapchat stories. Others kept their eyes on the banner in the hopes that by looking at the banner long enough, they would eventually recognize who the guest of honor was. This is the second year that students at the Catholic University have had the promise of a popular band playing at their school to look forward to. Last year, Walk The Moon and COIN kicked off the school year and left students with a memorable performance. 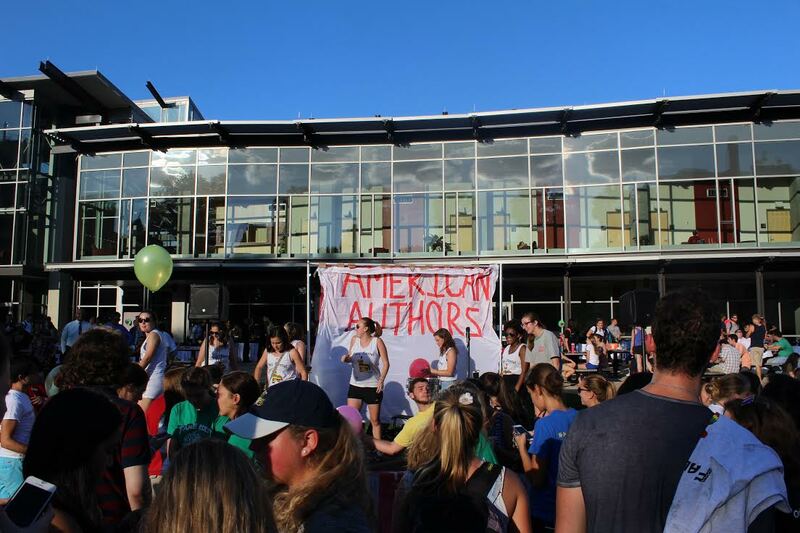 This year, the up-and-coming band, American Authors, will headline Catholic University’s Capital Fest. Meghan Adams, the Digital Marketing Chair for Program Board was very satisfied with how the big reveal panned out. Adams, like the rest of Program Board, was required to keep the name of the band hidden until Fall Fiesta. The band reveal for Capital Fest was one thing many members were excited to get off of their chest. Now that the band is revealed, Program Board is working day and night to ensure this year’s Capital Fest is just as successful as the last one. Their tasks include coordinating close to seventy volunteer positions, selling VIP tickets, making green rooms for the bands, and making sure all of the itinerary plans are in line for the big day. This year’s Capital Fest will offer water stations, more free giveaways and a $5 cheaper VIP package ticket. Jenai Bell is looking forward to the meet and greet that Program Board members are privileged to have. “I have never heard of the band before this year, but I am excited to meet them and hope everyone decides to attend,” said Bell. American Authors is an Indie Rock and Country band coming from New York City. The band originates from Boston, Massachusetts where the members met while attending Berklee College of Music. Since then, American Authors has opened up for groups such as Cash Cash and have one studio album. American Authors are most known for their hit singles “Believer” and “Best Day of My Life,” which have been featured in TV commercials, film trailers, and video games. Capital Fest will take place on Saturday, October 3rd from 7:00pm to 11:00pm on the Columbus Law School lawn. Capital Fest is free for all Catholic University undergraduate students and guest tickets are available for $10. Program Board is also selling a limited number of VIP tickets that provide students with a t-shirt, early concert admission and access to a front row standing section. Tickets can be bought online or at a table in the Edward J. Pryzbyla Center lobby on weekdays between the hours of 12:00 PM till 2:00 PM, and 5:00 PM to 7:00 PM.